Easton Farm Park is an educational farm near Woodbridge in the Suffolk countryside. The farm was built in the late 1880s at the bequest of the Duke and Duchess of Hamilton, who owned Easton Mansion. They were not building the farm for practical reasons however; instead the farm was purely decorative and many of the original Victorian brick buildings are still in situ. 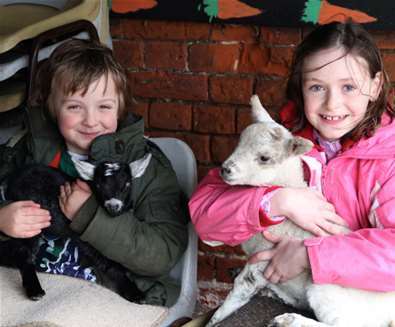 Easton Farm Park opened as a visitor attraction in 1974 and is a lovely place to introduce children to the countryside. During the peak season there are a daily range of activities including pony rides, train rides, hug a bunny, hold a chick and lots more. There is also indoor and outdoor play and lovely walks around the water meadows and along the river Deben. Visitors young and old can enjoy the fun activities the park has to offer, including pony rides, train rides, meeting all the animals and even cuddling a few of them, too. Easton Farm Park also holds fabulous fun day events and even a three-day music festival 'Maverick' every July!